Slovenia is a republic country, formerly part of Yugoslavia, that gained independence in 1991 after a short conflict. In truth, Slovenia had always been the most prosperous and western-facing of the former Yugoslav states. Slovenia’s cultural and social attitudes have been influenced by its neighbours Italy to the west, Austria to the north and Hungary to the east. Croatia to the south is an important trading partner, but Slovenia has fully embraced Europe, being part of the EU since 2004, and adopting the Euro as its currency. Indeed in January 2008 Sloveniatakes over the EU presidency, just as the Schengen Agreement removes all border controls with Italy and Austria. Slovenia today is a confident democracy that engages with the rest of the world both politically and economically. Its naturally western-facing tendencies have flourished, and there has been a growing buzz about Slovenia over the past year or so. With its unspoiled and beautiful countryside, from the Adriatic coast to Alpine slopes, the country has become something of a tourism hot-spot, especially for activity holidays with cycling, walking and rafting, and skiing in the winter months. To the north-east, the region of Podravje is the largest vineyard area. It has a continental climate, and is known for its sparkling and dessert wines. Just to the south is Posavje, where some very good quality wines are made, but also a deal of Cviček, a light, pink wine made by blending red and white wine grapes.But this feature concentrates solely on the most westerly of Slovenia’s three wine regions, Primorska. Primorska enjoys a more Mediterranean climate, with some diverse micro-climates. Its land is largely a continuation of Italy’s Friuli region, and soils range from flysch – a friable mix of sandstone, marl and sandy shale – to the rich terra rossa of the Kras plateau. Slovenia grows a fascinating mix of indigenous, Italian, and international grapes. Slovene varieties like Pinela and Zelen are bottled as varietal wines, as are many grapes familiar to fans of Friulian wine – like Rebula (Ribolla), Pikolit (Picolit) and Refošk (Refosco). In terms of French varieties, Sauvignon Blanc, Chardonnay and Pinots Gris and Blanc are common for whites, whilst Merlot, Cabernet Sauvignon and Cabernet Franc are being joined by Pinot Noir for reds. Standing on the balcony of the Movia estate in the Brda region, a timeless landscape of rolling vineyards and pan-tiled farm buildings stretches as far as the eye can see. A bell begins to toll in a hilltop church across the valley, as clear as birdsong, evoking a sense of harmony and tranquility. Impossible to imagine though it is, that church is in another country, for just a few dozen metres from where I stand, Slovenia becomes Italy. The political boundary – nothing more than a line on a map – seems absurd. Once over that invisible boundary – not marked by any sign or fence – Brda becomes Friuli. Aleš Kristančič, Movia’s owner and winemaker, points out his vineyards, scattered across both appellations, showing me the source of the fruit for the various wines we are tasting. Should he care to move his winery a hundred metres or so west, his wines would carry the D.O.C stamp of Friuili. Indeed, the best-known name of this region is Josko Gravner, who enjoys a cult following for his extraordinary wines, where very long skin macerations mean fruit is submerged beneath all sorts of waxy and mineral tones. Like Kristančič and many others, Gravner farms both in Slovenian Brda and Italian Friuli. But because Gravner’s winery lies in Italy, his wines are Italian and Slovenia’s wine reputation does not benefit from the ‘Gravner effect’. His success, however, has had a powerful impact on a small group of winemakers. They are acutely aware of Gravner’s philosophy and have embraced the same natural farming and winemaking techniques, using minimal chemicals, minimal or no sulphur, and only ambient yeasts to manage implausibly long skin macerations. This extreme winemaking teeters on the edge, where results can be thrilling, but disaster awaits those who do not harvest perfect grapes or practice perfect hygiene. In the vineyard Miha does green harvest, but doesn’t follow a practice common amongst some winemakers, of snipping the bottom off of individual bunches: “The top of the bunch has the sugar, the bottom has acidity. Some people cut off the bottoms to lower acidity, but that’s like cutting off someone’s legs: they may be the ugliest part, but we need them for balance.” Batič’s wines range from some easier going, off dry styles, to their premium range which has the full “Gravneresque” treatment, and is more challenging, but of terrific, complex quality. 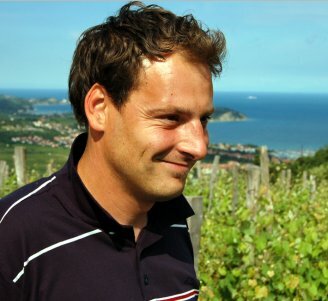 Matjaž Lemut runs this estate, whose wines are not currently in the UK, with a commercial, modern outlook. He is happy to use selected yeasts to enhance the aromatic profile of his wines and has two brands, ‘Sunshine’ and the “reserve” label known as ‘Golden’. Matjaž explains that in Slovenia there are still 10 big cellars/ cooperatives that account for half of all production. The other half is composed of thousands of small producers, farming between two and 15 hectares, whilst a big coop might farm 1,200. There are still many ‘hobby’ producers (“afternoon farmers”, says Matjaž) farming up to 2ha. This is a problem, because that equates to around 1,000 bottles of wine, which makes its way onto the market, sold very cheaply without taxes being paid or bottling costs. To protect and separate the small, quality estates, the ‘Family Estates of Slovenia’ has been formed, with 90 members each holding a minimum of 3ha. They are lobbying the Slovene government to gain a special status. “But,” says Matjaž, “there are lots of votes in those thousands of small farmers…” All of Tilia’s newer plantings are at high density, and all training has been converted to single guyot, in moves to increase quality. Already 20% of the production of modern, good quality wines is exported to the USA. The third Vipava winery is Sutor. Their wines are imported into the UK by Astrum Cellars, who supply the top-end restaurant trade. 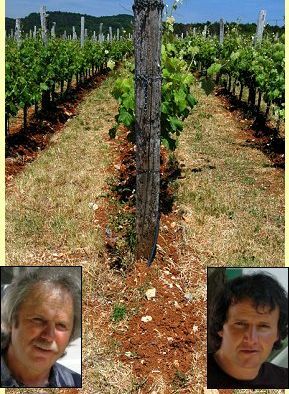 Primoz Lavrenčič (left) and his brother Mitja have replanted many vineyards from an old terraced arrangement to rows up and down the slopes for better sun exposure and to establish densities that he thinks are optimal. Though Sutor makes almost exclusively white wines, they have begun a Pinot Noir project with exciting potential. Primoz explains that Sauvignon and Chardonnay have been planted here since before the second world war, by the ‘noble people’, mostly German and Italians, whilst the local Slovenes grew Rebula and other indigenous grapes. The soil is decomposed slate and marl, and the vineyard in the photograph is 65-year-old Malvasia. Primoz says he hasn’t green harvested his Chardonnay for 12 years, because the wines are in perfect natural balance. 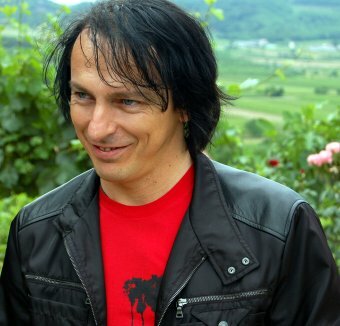 He believes Merlot is well-suited to the region’s soil and climate, though is still challenging to grow: “Merlot grows beautifully – the perfect grape – though still the wines are a little green in many years.” A family estate since 1922, Primoz is winemaker, whilst his brother Mitja works mostly in the vineyards. But with only four hectares (yielding about 1,500 bottles), both have other jobs – Primoz is a researcher at the local University, and Mitja is director of the local Post Office. 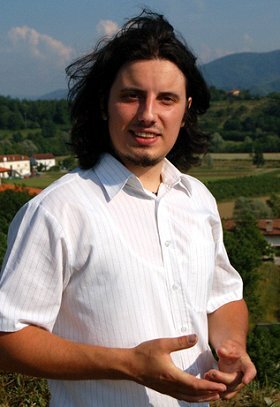 Aleks Simčič has now taken over the running of this estate from his father Edi. Having supplied the local co-op for many years, they have been a winemaking estate since 1990, farming 10 hectares. In some ways this is the most “international” of the estates I visited on this trip, with all wines, white and red, fermented in barrels, mostly barriques and 100% French oak. 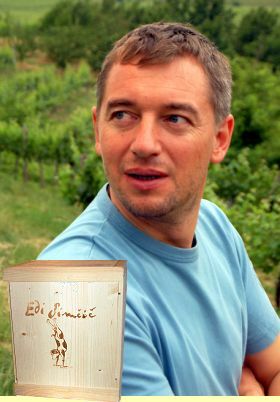 70% of Edi Simčič’s production is exported. There is minimal spraying in the vineyards, with no herbicides, and grass cover used between rows. The farm is “More or less organic,” according to Aleks, “though I don’t push that too much.” Only 15 miles from the sea, there is a clear maritime influence on climate, with cooling breezes. Mandarins and kiwis are grown, and the area hasn’t seen a frost since 1997. Aleks says that cellar door sales are growing since Slovenia joined the EU – before that there was a limit on what Italian or Austrian visitors could take home. One of the wines on our tasting – the Wine with no Name is a project that will produce a super-premium red blend. “The first icon wine of Slovenia?” I ask Aleks, who laughs: “The story starts in 1997, when we made fairly rough reds so we radically changed yields, vinification, and tannin management. We started a totally new oak regime, and a careful selection, with some wine not being used, but sold off. Now we are homing in on vineyard and barrel selections for this wine. 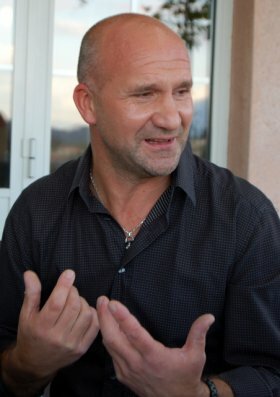 It has great potential.” Astrum cellars also imports Edi Simčič into the UK. Farming 16 hectares only 10 kilometres from the coast, some new planting is as dense as 10,000 vines per hectare. The soil here is flysch, and new land is relatively inexpensive at around 6,000 Euros per hectare, but it is very difficult to find it. Maceration for most wines is followed by one year in big wooden casks, then the wine is transferred to 500-litre barrels of both Slovenian and French oak. Marjan selects Slovenian oak and cures it for 10 years in the open air before having it coopered, to eliminate hard tannins and greenness. Stojan Ščurek farms 17 hectares of vines and produce up to 60,000 bottles in a year, making this estate one of the region’s larger independent estates. Tomaz Ščurek (left) has now joined his father in winemaking and running the business, although all of Stojan’s five sons are involved. 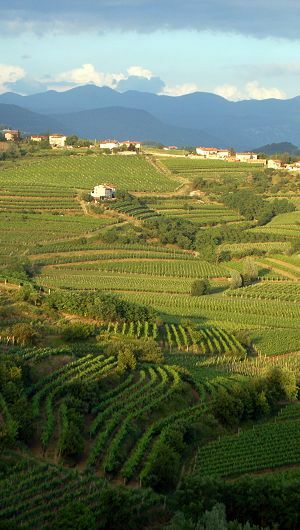 The majority of their vineyards are on the Italian side of the border, and Ščurek exports around 45% of its production, mostly to the ex-Yugoslavian states, but also across northern Europe. These are very solid, fruity, good quality commercial wines with minimal skin maceration: just six to eight hours in the press for whites, before chilling and to stainless steel for fermentation. Reds are macerated for 10 days or so for. In the cellars, classical music is played to the slumbering wines. One interesting wine in the Ščurek portfolio is called ‘UP’. The word up means ‘hope’ in Slovenia, but U.P. also represents the Slovenian words for ‘enjoy slow’ – in fact this wine was originally created for the Slow Food movement, and has now become a regular part of their production. 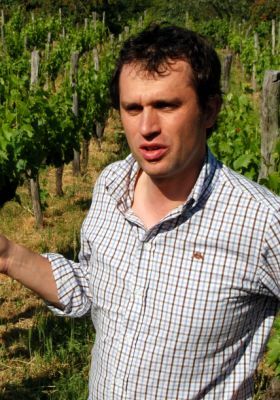 In Brda, the human dynamo that is Aleš Kristančič oversees one of Slovenia’s most confident and ambitious estates. Movia (represented in the UK by Lea & Sandeman) is fully biodynamic, and a member of Nicolas Joly’s Renaissance group. 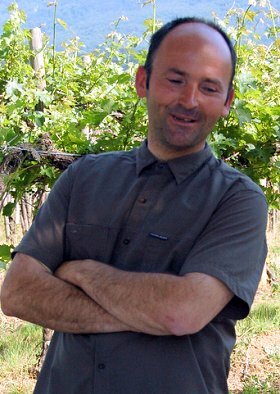 In fact, Aleš says he is the eighth generation to farm these vineyards organically, though under his direction the biodynamic approach has been embraced passionately. Instead, it is sold with instructions on how to disgorge it at home (or more commonly, in a restaurant), in a tank full of water, where the yeast shoots out under pressure. The wine sounds a little crazy, but each step is designed to make the wine as natural as possible, introducing nothing that did not originate in the same vineyard. “I want to crush the grape straight into your glass” says Primoz Rojac, explaining that capturing the essence of the fruit and his terroir is at the heart of his vision for Rojac. Here on the Istrian peninsula, the maritime influence on the climate is obvious as we stand looking over the vineyards (left). Primoz explains that this region has grown wine for centuries, but in the 1950s under Tito, much of the skill and the knowledge moved away and was lost. Istria was earmarked to produce red wine for all of Yugoslavia, and so the object was quantity, not quality, with new plantings in widely spaced rows giving very high yields. Father and son team Branko and Vasja Cotar (left) farm their vineyards in the Kras Valley, an area that enjoys a benign climate of low humidity and rainfall thanks to the rain shadow caused by surrounding mountains. This is a unique Slovenian terroir of terra rossa soils over pure limestone, just like Australia’s Coonawarra. Their seven-hectare farm is two years into a three-year programme to gain organic certification, and only natural ambient yeasts are used in vinification, with a minimal of sulphur. Cotar ‘s white wines are macerated for one to two weeks, and reds for at least 15 days. All are matured in older oak for two to three years. A few wines, or proportions of them, see much longer macerations. There is drip irrigation in place, but it is used only in exceptional circumstances. The photo above shows a 50-year-old Cabernet Sauvignon vineyard and the iron-rich terra rossa. The wines of Cotar are not currently imported into the UK.